Miss Arundell died on May 1st. Though her illness was short her death did not occasion much surprise in the little country town of Market Basing where she had lived since she was a girl of sixteen. For Emily Arundell was well over seventy, the last of a family of five, and she had been known to be in delicate health for many years and had indeed nearly died of a similar attack to the one that killed her some eighteen months before. But though Miss Arundell’s death surprised no one, something else did. The provisions of her will gave rise to varying emotions, astonishment, pleasurable excitement, deep condemnation, fury, despair, anger and general gossip. These are the opening lines of Agatha Christie’s Dumb Witness. And because it is an Agatha Christie book, it is obvious that Miss Arundell’s death should be cause for suspicion and that it was most unlikely to have been a natural death. From the fact that the date of her death is specified in the first sentence makes me think that must be significant. And the surprising contents of her will also indicate that Miss Arundell had perhaps changed her it – why was that? 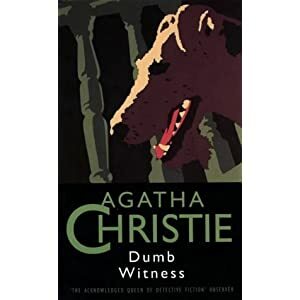 I’m still reading Dumb Witness and as the title indicates and the cover picture on my copy shows, a dog has an important part in the mystery – one which Hercule Poirot has to solve, with very little to go on. Book Beginnings on Friday is hosted by Katy, at A Few More Pages. According to internet information Christie murders from four previous books in this one. Meaning that you should read those four book before you reda this one. Gunnar, you can read Dumb Witness without reading any of the other Hercule Poirot books – they are all complete in themselves. I have only read one Christie book and that was And Then There Were None. I enjoyed it! I read it last year. Ah, now I want to read this one! Love how the opening lines arouse our questions, even as it (somewhat mildly) seems to hint that there is nothing surprising about the death. Agatha Christie is always a good choice! Glad you’re enjoying it. I haven’t read this one for a while…but I have the David Suchet DVD and watched it not too long ago. What an opening! I couldn’t stop reading. I’ve never read an Agatha Christie mystery but I do have one on my bookshelf so that could be my weekend reading! Now I prefer Miss Marple to Poirot, but I liked this one. The beginning is excellent, and the idea of using a dog was great.